A few days ago marked the 10th anniversary of the start of the 2nd Intifada – armed attacks, suicide bombings, and launching Qassam rockets into Israel, all of which claimed over 1100 Israeli lives, with thousands more wounded. Like most Israelis, I know one of the victims. This essay is my attempt to briefly tell her story. The suicide bomber who sent hundreds of pieces of shrapnel tearing into Gila Weiss’s body when she blew herself up at a bus stop next to Mahane Yehuda market (The Shuk) in Jerusalem in 2002, was a 21-year-old Palestinian woman disguised to look like she was pregnant. The bomber, Andaleeb Taqataqah, was recruited by Aksa Martyrs Brigade – controlled by Fatah, which, at the time, was controlled by Yassir Arafat. Weiss, then 31, was also so badly burned and disfigured by the blast that her roommate was able to identify her only by the nail varnish on her toenails – her feet protected, she noted, by the ”…brown leather Naot brand mini-boots that covered my feet up to right below my ankles”. Nearly every part of Weiss’s body was pierced by shrapnel – bits and pieces of metal, glass, wood, pebbles, and plastic from objects damaged or destroyed by the blast, as well as, more than likely, pieces of the suicide bomber herself. Despite the many surgeries she had to endure, the doctors weren’t able to locate or remove every last piece, and, to this day, projectiles from that horrible day remain in her body. The bomb which tore through Weiss was manufactured from three tubes of plastic explosives and a battery, which were placed in a black purse to camouflage it. On the day of the attack, the terrorist was driven to Abu Dis and from there she took a taxi to Jerusalem and made her way to the Shuk. When the terrorist realized that everyone was being checked at the entrances to the market, she turned around and walked towards the nearby bus stop, opposite Hava Bakery. There, she waited a short while, until a bus arrived. When the driver opened the door, and the passengers began getting on and off the bus, she blew herself up – killing 6 people, and injuring a total of 105 (including Weiss). A number of days prior to the attack Taqataqah was videotaped dressed in black and holding a Koran. “I [could] have died and never known it. There would have been no goodbyes, no final thoughts of my loved ones, nothing. Everything that was in my mind, all of my loves and hates and hopes and dreams, everything that makes up who is Me, would have been instantly and completely wiped out. The two hours I spent with Gila recently, on an organized bike tour near Mesilat Zion – 7 years after the attack – through often hilly and challenging terrain that afternoon seemed to suggest that she has largely recovered from her injuries and that the reconstructive facial surgeries were very successful. What most struck me when reading Gila’s blog posts following the attack was that the thing which seemed to shock her the most, the element of the assault that she simply couldn’t accept, was her complete powerlessness in the face of an enemy who strikes at Israeli civilians, arbitrarily, wherever the ”opportunity” presents itself, and without warning – without even a second to fight back and resist the attacker. 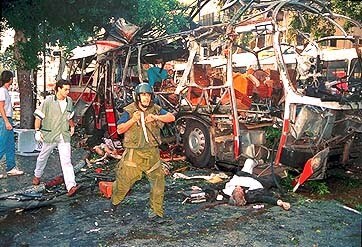 From 2000 until the end of 2004 (the period known as the 2nd Intifada) there were over a thousand innocent Israeli men, women, and children killed in such attacks and more than 7000 wounded – many of whom suffered catastrophic injuries (such as severe burns, amputated limbs, paralysis, etc.) that they are forced to deal with for the rest of their lives – a constant reminder of the brutal attack which changed them forever, and one which, like Weiss, they were powerless to resist. And the governments of the West support this infamy! The Guardian prints self-pitying articles from the perpetrators of them or those who support them. They pat these animals on the head and “there there” them! Where they condemn them at all it is a qualified condemnation. Gila’s life is a testament and a triumph. May she go from strength to strength. An article about the second intifada written by bleeding heart Seth Freedman concentrated on the woes of the Palestinians and completely ignored these horrific multiple murders perpetrated by them, approved by the conscienceless vast majority and celebrated in the streets with dancing and the distribution of sweets..
What kind of a world do we live in? What kind of rough beasts do we have as neighbours? One time when I was still living in London I was on my way home from work and waiting for a bus near Kings Cross station when an IRA letter bomb exlploded in a letterbox around the corner from where I was standing. After the explosion the people around me walked around the corner to see what had happened. I mus admit that I cried and was sick to my stomach at the devastation which it had caused. But mostly I was thankful that I had crossed that road where the letterbox was about five minutes earlier and not exactly then when it went off. I cant even begin to imagine what would have happened if I had been in the middle of the road. People like Gila should tell their story all over the world to show what can happen at the hands of madmen. She was lucky to survive and has a duty (imho) to tell about her experience in the name of those who didnt survive. My bomb in London luckily caused only material damage and nobody was badly injured but many other IRA bombs killed people. I’ve been following Gila’s blog for a couple of years now, ever since I read her post To Die in Jerusalem, Part I. I think she’s a truly remarkable person. what is most galling and tragic is that all this pain and suffering has been brought on by clinging to the delusional hope that peace could be obtained with genocidal barbarians.. I have to wonder at the morals and the bias of those readers who apparently marked the above comments down as 1 star. AKUS- While the majority of readers of CiFWatch are certainly supportive of the site, there are always a few who come on here (or just downgrade stars without commenting) who do not wish CifWatch, and its commenters, well. That’s the anonymous nature of the internet. Incidentally–I had surgery around one of my eyes and stitches/staples here and there on my face and my head. Apart from that though, no reconstructive surgeries.